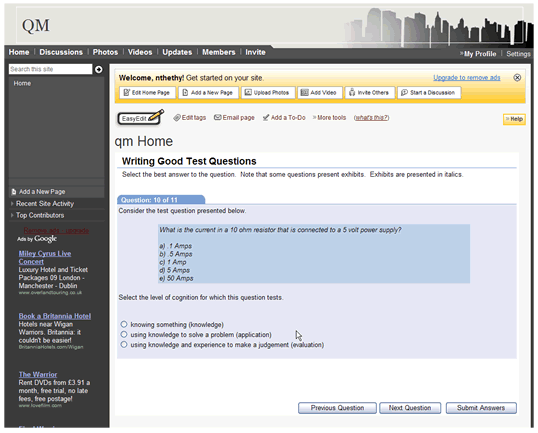 Embed a Questionmark Perception survey or quiz inside your Wetpaint page. To see how this would look, see a snapshot of an assessment embedded within a Wetpaint IFrame. Wetpaint provides social network service and wiki hosting service. Wetpaint utilizes the features of wikis, blogs, forums and social networks to help you create your own social Web site. Embedding an assessment into a Wetpaint page is simple. Wetpaint has the ability to add HTML to a Web page as a custom widget. You can therefore embed a Questionmark assessment by adding an IFrame widget to your Wetpaint page.